How did Spaces for Change transform from a Facebook jaw-jaw group into an international research and advocacy organization working to strengthen the participation of excluded groups – women, youth and communities – in social and economic governance in Nigeria? How is the organization using the social media to deepen democratic debate, public engagement and accountability in Nigeria? What are methods and strategies the organization has adopted to challenge or push back policies and legislative initiatives designed to limit and restrain civic engagement on social media spaces in Nigeria? 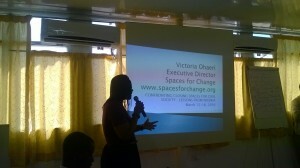 Spaces for Change’s Victoria Ohaeri shared the organization’s experiences with advocates from Sierra Leone, Uganda, Kenya, Nigeria and the United Kingdom at convenings hosted by the Fund for Global Human Rights between March 12-16, 2016 in Freetown, Sierra Leone. In 2009, Sierra Leone passed an NGO policy which places severe restrictions on the ability of civil society organizations to organize and receive foreign funding. Its provisions include a cumbersome registration and re-registration process, disclosure of NGO funding sources, submission of yearly financial and program reports to the government, and a requirement that NGO programs fit within the government’s development agenda. The policy also allows the government to make unannounced checks on NGOs to determine their level of engagement and compliance. In late January 2015, the Ministry of Finance began a process of reviewing the policy and moving it through the process of adoption by Parliament. The March 2016 seminar and the robust discussions they generated presented participants with the opportunity to learn about different perspectives and analysis of conditions that enable or restrict civil society, including the state of the relationship between government and civil society, and to identify where there is common ground and where the greatest barriers lie to developing a shared analysis, shared positions and a coalition. Groups like the Freetown-based Society for Democratic Initiatives (SDI) have facilitated broadbased-consultations and coordinated civil society action against the threatened restrictions in Sierra Leone. Nigeria is currently experiencing a similar restriction to civic engagement through the sustained attempts to use legislation to regulate social media activities. This attempt, widely perceived as an attack on freedom of expression, provoked public outrage and condemnation of the proposed legislation, called the Frivolous Petitions Bill. The Nigerian parliament has however, gone ahead to conduct a public hearing on March 7, 2016, after the bill passed the second reading. Victoria facilitated sessions that enabled participants to recognize parallels between what is happening in Sierra Leone and other countries in the region, – like Nigeria – and to anticipate some of the challenges they might face given the copycat nature both of restrictive legislation, negative portrayal of CSOs / civil society and other attacks on the enabling environment. Her paper demonstrated how to use the instrumentality of the law to confront measures designed to close spaces for CSO operations. Using Nigeria as a case study, Ohaeri compared the provisions on freedom of expression, assembly and association, which are legally protected under the Nigerian 1999 Constitution to those encoded in the African Charter on Human and Peoples Rights and the International Covenant on Civil and Political Rights (ICCPR). The comparison showed how relevant laws on freedom of expression in international and regional instruments are reflected in national laws. Her analysis technically assessed the gaps in the legal arguments for and against the restrictions on civil society activities, highlighting counter-arguments for evaluating the 2009 NGO policy and for framing proposals for amendments. Participants also worked together to examine strategies that have been used or are being developed in response to enabling environment issues in their respective contexts and globally. 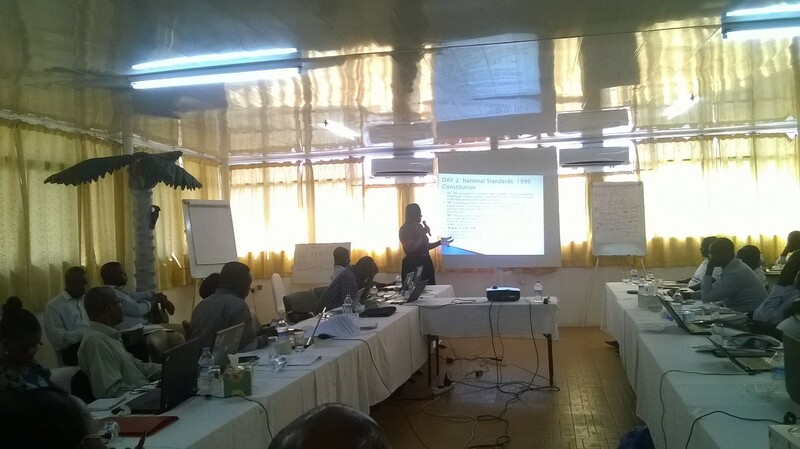 Some participants reported gaining increasing knowledge of how to mobilize their networks, supporters and allies at provincial, national, regional and international level to positively influence the Revised NGO Policy Regulations in short term, and the wider enabling environment, in the long term.